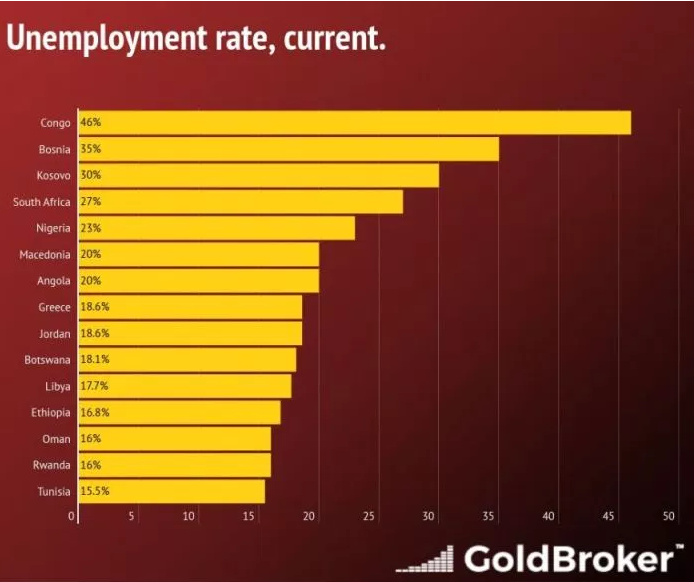 According to Gold Broker, Macedonia currently shares sixth place with Angola in the world according to the unemployment rate of 20 percent. Congo with 46 percent tops the list, second is Bosnia and Herzegovina with 35 percent, and third Kosovo with 30 percent. Macedonia is just ahead of South Africa with 27% and Nigeria with 23%. Macedonia is followed by Greece and Jordan with 18.6 percent, Botswana with 18.1 percent, Libya with 17.7 percent, Ethiopia with 16.8 percent, Oman and Rwanda with 16 percent, Tunisia with 15.5 percent.